the form of a mild ‘negative’ charge. In our daily lives we build up a ‘positive’ charge in our cells. restoring a healthy natural balance. hard for your body to return to neutral. Q. How does grounding work? as we are efficiently shielded by the Earth’s natural energy. offers the same connection to the Earth via the domestic mains ground. Q. 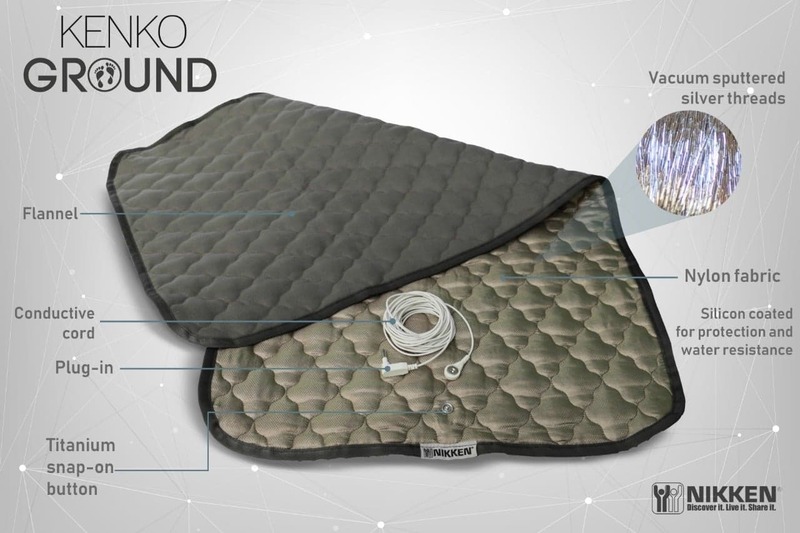 Can the KenkoGround® be used together with magnetic products? Earth’s magnetic field as well as protection from electrical pollution. Q. Is the KenkoGround® different from other products on the market? way the Silver Ions are implanted into the material through a specific ‘spluttering’ technology. silicon based coating which protects the product and makes it water resistant. Q. What are the KenkoGround’s benefits and features? control. High efficiency of conduction. Controls the negative effects of electromagnetic fields. Improves sleep quality and overall wellbeing. Q. Can I roll or fold the KenkoGround®? hour after using body lotions, oils or aromatherapy oils on your skin. needs to be a very small area of direct contact to benefit from the product. Q. How long do I need to stay grounded to feel the benefits? particularly when near powerful electrical equipment such as a computer. that you consult a medical doctor. monitor their medication after usage. Q. How does grounding work via the domestic mains? to including the earth pin on the mains socket. socket should be switched off while KenkoGround® is connected to reduce electrical usage. spend grounded the better. Ideally, use the KenkoGround® whenever practically possible and particularly when near powerful electrical equipment such as a computer. The KenkoGround is COMING SOON - please contact me with your interest. 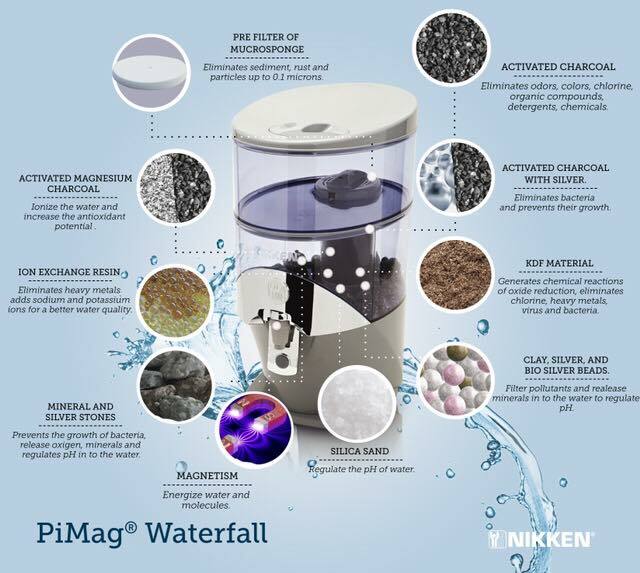 The Pimag® Waterfall is Nikken's flagship water filter product. Available as a stand alone counter top unit or via a portable water bottle many people are discovering the health benefits of Nikken water and the delicious taste which is so good it just encourages you to drink more - and we all know that is a good thing! If you are new to Nikken water, or an existing customer who already has a Waterfall or Portable Bottle read on to discover answers to our frequently asked questions. If you have a question not answered here please drop a comment below or contact me direct on nicki@nutritionandhealing.co.uk I will be delighted to answer your questions. Q. Some of the water in the top tank seems to not filter and gets stuck. Is this a fault? A. No, this is not a fault. It is probably because there is an air pocket under the pre filters (the sponges). The pre filters should be removed and squeezed to remove excess water and re fitted. If not, there may be a bubble under the plastic separator located on the top of the filter column, just below the woven filters. If this occurs, pushing a blunt object down through this cap (poke it a few times in different places) will usually do the trick. Q. My filter filters the water slowly. A. The filter particularly when new may filter more slowly than normal. This should improve after a few days. Give the sponge pre filters at the top of the filter a little massage and press in order to release any blockages or air pockets. As the system is a gravity system keeping the top tank full will encourage a quicker flow through to the bottom tank which in turn, when fuller, will encourage a faster release through the tap. Q. What is the best soaking time for the filter? A. The optimal filter soaking time is overnight / 24 hours. The pre filter sponges should be soaked too. Q. Do I need to run water through a new filter? A. Yes, we encourage users to run a full tank of water through a brand new filter several times before drinking. This will help remove any trace elements and a slight metallic taste that may occur at first. Q. Sometimes my filter leaks water down the side and into the bottom tank without passing through the filter, how can I stop this? A. This is particularly important to check when you replace your filters. Otherwise unfiltered tap water will reach the drinking chamber (this can be seen, and tasted). You should first carefully check that the filter is positioned correctly in the top tank and pushed all the way down the hole so it sits on the ledge and the (purple) seal is flush all the way round. It can happen that the filter is not level and the water leaks on one side. A good option is to remove the top tank while the filter is in place and grab the bottom of the filter while using your thumbs to push against the bottom of the tank. This enables you to manoeuvre the filter into place and to make sure it is level. Once you have done this you can fill the top tank to test that the leak has stopped. Q. Do I need to clean the Waterfall? A. Yes. The waterfall should ideally be emptied and cleaned thoroughly inside and out every month, and at least at time of filters changes. If the system has been left unused for a period of time give it a good clean beforel starting it up again. Q. My Waterfall is showing signs of some greenness or algae in the chambers? A. This is very unusual but if it does happen stop using and give it a good clean. Then try repositioning the system somewhere else preferably not in persistent direct sunlight. If it is positioned on a window sill in direct sunlight protect it by a blind. If the system is not going to be used for a while, drain it, and store it away somewhere safe preferably in its box. If the problem persists please contact me. Q. Can I move the Waterfall around? A. Yes, it is relatively light and portable (when not filled). Drain both chambers completely and take out the stones for safe transport. Q. How do I fill the Waterfall? The best way is to have it positioned somewhere near your tap and transfer water into the top chamber via a jug or pitcher. Similarly a jug or pitcher or bottles can obviously be filled with the filtered water. For ease of access to the Waterfall tap some users will find it is best to position the Waterfall on a stand or counter top such that the tap overhangs a drop. Q. I've heard that goldfish can live much longer in Pimag Waterfall than in regular tap water. Is this true? A. We do think Pimag water is the healthiest and most life giving water you can get so we would not be surprised to hear this is true (apparently someone has tested it!). However the Waterfall itself is not a fish tank and although it could probably filter any type of contaminated water in the top tank it is not recommended that it is used this way for human consumption (or the fish). By all means try filling your regular aquarium with Pimag water though. Q. Can I give Nikken water to my pets? Absolutely. As with humans, pets will also benefit from the improved hydration, antioxidants and higher pH values of Nikken water. You may find that older animals will be more energized when they start drinking Nikken water. Your house plants will also love Nikken water. Q. Can I use it to wash my windows? A. Apparently reverse osmosis (RO) water is best for window cleaning as it has been stripped of all minerals and thus does not leave any residue on your glass after drying. We wouldn't want to drink it though. Q. How long will Nikken supply the replacement parts for the other Water products? A. Parts and filters for previous models of the Waterfall such as the Maxi will be supplied for a number of years in the same way as we have continued to supply other discontinued products. Q. Where is the 1200 gauss magnet positioned and what is its purpose? In the documentation it states that this decreases agglomeration. A. The magnet is located in the blue tube inside the bottom tank where the water flows through to the tap. Water molecules are dipolar (differing electro-charges at each end) and tend to attract each other. Magnets affect the bonding angle between the hydrogen and oxygen atoms in the water molecule. This in turn induces the molecule cluster groups to become smaller and this is suggested to increase absorption. Agglomeration is defined as the gathering of mass and as the magnet reduces this mass into smaller clusters it decreases agglomeration. To read more about the science please see this post. Q. What is ion exchange resin? A. Ion-exchange resin is used in water purification products and is there to help remove heavy metals while also adding ions such as sodium and potassium that help towards alkaline water. Q. What are those stones for in the Waterfall? The stones are special pebbles mined from the ocean floor off Korea. They replicate the natural environment of a natural spring and serve to add minerals and electrolytes to the water. Q. Do I need to replace the stones? A. Yes, we recommend they are replaced annually. In between times they can also be taken out and rinsed occasionally. Q. The first layer of the filter contains carbon and alkaline materials. What are these alkaline materials? A. The alkalising materials will be a number of minerals that promote alkaline water. Nikken does not release a full specification to customers due to proprietary requirements safeguarding our products from being copied. Q. The second layer contains clay granules what is their role? It also contains bio silver and minerals. What are these minerals? releasing minerals that help increase pH. Q. The third layer contains fine silica and KDF. What is KDF? The golden layer at the bottom - is this KDF or silica sand? A. KDF (Kinetic Degradation Fluxion) is material that again assists in the reduction of contaminants. This will be the gold looking material. Q. Through the filtration process, oxidizing potential is reduced. How does this work? A. ORP is a measure used in some water filtration systems and stands for Oxidation Reduction Potential. Technically ORP is a measure of a water system’s capacity to either release or gain electrons in chemical reactions. It is measured in millivolts and indicates if a solution is oxidising or deoxidising. The higher the positive number the more oxidising the solution is (and the less beneficial); a lower positive number or a negative number will denote that the solution is deoxidising and contains antioxidants (more beneficial). Therefore the lower the number the better (although note there is an important trade off with pH as a low ORP also means a high pH, which can be too high). With the reduction of oxidising chemicals such as chlorine in our Pimag water the ORP levels will lower and therefore show that the water has more antioxidants. Q. What is the pH? A. The PiMag Waterfall has been tested in laboratory conditions and has shown to increase the pH of tap water of around 7 to 7.5pH to between 8.5 and 9.5pH. Each country and area may differ depending on the source water used. Q. I have heard that it is good to drink water with a high pH indicating alkalinity rather than acidity but can the pH be too high? A. Yes, it is considered unhealthy to drink water that has a pH of 10 or over. Such highly rated pH waters often have a very low ORP but the negative health effects of water with such a high degree of alkalinity outweigh this benefit. Q. What is naturally alkaline water? A. Water can be made more alkaline by natural processes such as adding minerals as in the Nikken water, or artificially by electrolysis. Q. Should I use the PiMag water in my kettle? A. Yes, definitely. It will transform your teas or coffees and you will appreciate the difference from tap water very quickly. Furthermore many nutritionists and health practitioners advocate drinking hot water without tea or coffee and this will definitely taste so much better with our water filter. Q. My Waterfall water tastes a bit "metallic"? The Nikken water is so distinctive from tap water it is normally obvious when the water does not taste right. An initial metallic taste may occur when the filter and/or the stones are brand new. New filters should be soaked for at least 8-12 hours or overnight if possible, and water passed through several times before insertion. The Waterfall should then be flushed through with the new filter in place several times before the water reaches it's normal taste. New stones should also be soaked at first and then will settle down over the first few days. Also do test that all the water from the top chamber is passing through the filter and not leaking down the outside (see above). Q. Is there a major difference in the 1 micron filtration level of the Waterfall compared to the 0.02 micron level in the older Maxi model? minerals. The filtration process has been rated, in a laboratory, at 1 micron which will filter a very high percentage of contaminants found in tap water including microplastics. Our test results prove that the Waterfall matches or exceeds previous water systems in filtering contaminants and adding minerals. Q. How often do I need to change the filter? A. The filter life span on the PiMag Waterfall has been rated at 900 litres based on the continued filtration levels required to meet specific contaminant reduction levels. For a family of 4 using the Waterfall for all their drinking and cooking needs the filter will generally last approximately 3 months. This is an incredibly economic and ecologically friendly way to drink filtered water working out at approximately 4p per litre. Q. Filter change times are stated as every 900 litres or every 3 months. If I used it 10 times only in 3 months do I have to change the filter? A. You will not be receiving the full benefits of the system if you only use in short periods. There is some degree of deterioration of the effectiveness of the filter over time as well as use so some do advocate a change once capacity or time is elapsed, whichever is the sooner, but generally replacement part times are based on a constant usage. For a family of 4 we find the 900 litres and 3 months roughly coincide. Q. Do any of the Nikken filters remove viruses or bacteria? not test for specific viruses or bacteria but tests show the Waterfall will reduce a large number of metals, pesticides, herbicides, insecticides and fungicides. Q. Does the filter remove chlorine? Q. Does the filter remove lead? Q. Does the filter remove fluoride? A. Fluoride is a particularly difficult substance to remove from water usually requiring specialist and expensive filters. However tests have shown that the Nikken filter will remove approximately two thirds of the fluoride present in tap water. Fluoride is not generally added to UK water except in some authorities (approximately 10% of the population - check your postcode here http://www.wmaf.org.uk/…/FLUORIDATED%20POST%20CODE%20AREAS%…). It is more common in the US (the most fluorinated country in the world) where approximately 75% of the population are affected, Canada (approximately 50%) and South America (especially Brazil and Chile). The Pimag Waterfall retails for £255 (plus p&p) in the UK. Please navigate to http://piwaterfilters.com to learn more. Replacement filters can be ordered through myself or direct online via https://tiny.cc/nikkenparts Savings can be made on setting up a regular "autoship" for your replacement filters (please contact me to arrange). The reorder parts code for the Waterfall filter is 13845 (the filter is an all-in-one device including sponge filters that does not require a separate order of other parts) (if you have an older model please check with me if you are unsure). The reorder parts code for the Stones is 13846. These can also be ordered online and via autoship if preferred. Our bodies are around 70% water. We use this water for virtually every bodily function. Water aids digestion and transports nutrients. Water is important to circulation and cleanses wastes and toxins. Water helps to regulate our body temperature and lubricates joints and soft tissues. Water helps activate your body's immune system and is an essential component to aiding your natural healing processes. Water is not a beverage of choice, but an essential nutrient! It is thought that water even helps to provide energy for the brain. And yet, we don't drink enough water. Estimates suggest around 75% of us are chronically dehydrated. More than 1 in 3 have a thirst mechanism that is so weak that it is often mistaken for hunger. Water can not be produced by the body in sufficient amounts and must be supplied from an outside source. We lose water each day when we go to the bathroom, sweat, and even when we breathe. Loss of water is faster when the weather is hot, when you are physically active, or if you have certain medical conditions such as a fever, vomiting or diarrhoea. Signs of dehydration include dry mouth, little or dark urine, strong smelling urine, constipation, low energy, fatigue, sluggishness, headaches, dizziness, stretch marks, confusion and muscle spasms. In fact many ailments and illnesses are actually signs of dehydration. It varies from person to person, climate and conditions. As we age we naturally dehydrate more and many people, if not most, are in a constant state of dehydration. In my nutritional practice I see clients with as little as 30% water composition*. For example if you are 10 stone, you are 140 pounds. You need at least 70 fluid ounces or 3 1/2 pints of water or 2 litres per day. Top Drinking Tip: Drink a pint of water on rising first thing in the morning at least half an hour before breakfast. This is a great way to start your day and get a large proportion of your requirement sorted first thing. People aren't drinking enough water largely because they don't like the taste of it. Nature constantly recycles our water. Evaporation leaves behind contaminants. The rain joins streams where the water spirals down it's windy path being filtered by sand and energised by the sun and the magnetic field of the earth along the way. Minerals are then added by the stones it runs over and the final result is nourishing, life-giving water. Top Drinking Tip: Drink hot or warm (not cold) water. This allows water to pass straight to the colon without having to be warmed up in the stomach first. It is also very refreshing this way and many people find it a good substitute for tea. However, between population growth, human waste, dumpsites, pesticides, fertiliser and animal waste, along with industrial hydrocarbons, toxic chemicals and acid rain, we have polluted our air and our streams to the point that no one trusts the safety of their water. Our municipal supplies are recycled numerous times through multiple households! Water is pumped through straight pipes (sometimes lead) to our taps or supplied in leaching plastic bottles. Water at it's natural source is very different after it has been subjected to such unnatural processes and can lose it's natural "living structure" within 72 hours. Part of the solution is the chemical treatment of our water supplies in an effort to eliminate some of the contaminants that have accumulated. These chemicals can cause still other contaminants such as chlorine byproducts. Chlorine is a highly reactive chemical which is not good for our gut and hardens our arteries. Not only does it deaden the water stripping it of its natural life giving qualities, it also tastes rank. With microbiological threats, as well as organic, inorganic and volatile organic chemicals, we have much to be concerned about. People are now turning to filtration of their water at the point of consumption. Many such solutions exist. Learning about the pros and cons of each alternative is important to help you find the answer. These filters work by absorption. They capture contaminants by making them adhere to the carbon in the filter. They do a good job improving the taste and odor because they reduce the level of chlorine byproducts. They may even remove or reduce the level of lead and some lighter weight volatile organic compounds (VOCs). Carbon filters however do not remove bacteria, parasites, heavier VOCs, organic chemicals or help with Total Dissolved Solids or heavy metals. Table top pitcher jugs like Britta use granulated activated carbon to filter out chlorine and make water taste better. The downside is that the filters are extremely basic and leave behind the majority of contaminants. The water they produce is still high in toxicity and usually acidic. Ceramic filters work in a similar way to carbon filters. They also use the principle of absorption. They have all of the same benefits and problems as carbon filters. They do have one additional benefit in that they may alkalinize acidic water. With this method of purification, water passes through a chamber that has an ultraviolet light. The ultraviolet light disinfects or reduces the amount of bacteria. This expensive process needs to be used with other filtration in order to remove other impurities. Ultraviolet treatment, also does nothing to help the pH level of acidic water. With this type of filtration, water is forced through a membrane that removes contaminants from the water. These membranes can remove chlorine byproducts, parasites, some bacteria, industrial chemicals, lead, nitrate and toxic metals. The contaminants are washed away with water. They are not effective at removing lighter weight VOCs. Two problems can arise with reverse osmosis. First the slow process wastes precious water. Second, while removing contaminants, reverse osmosis systems tend to remove all of the beneficial minerals from water, leaving it acidic. Distillation systems boil water and collect the vapours. The process can do a great job of leaving behind heavy metals including arsenic. The boiling process should also kill any bacteria that may be present. However VOCs are not removed with distillation as these chemicals tend to boil before the water does and are collected in the vapours. As well, alkalinizing minerals are removed, leaving the water acidic. Water ionizers raise the pH of drinking water by using electrolysis to separate the incoming water stream into acidic and alkaline components. However this form of unnatural purification tends to strip the water of it's natural healthy minerals providing an artificial alkaline water. Many people turn to bottled water to give them peace of mind. And yet, bottled water is usually nothing more than water from a civic water supply that has been run through one of the filtration systems listed above. The deficiencies of the filtration method used can be amplified since the water is then stored in plastic bottles which may contain bacteria. Water is best stored in glass. Plastic can transfer odors, flavours or even leach residues into the water stored inside bottles. pH refers to "potential for hydrogen". All fluids have a pH from 0 to 14. Any fluid with a low pH is acidic. Our internal body fluids have a slightly alkaline pH level of 7.35-7.45. Acidity in our body is usually associated with trouble such as inflammation, infection and disease. It is believed that alkaline water helps to restore balance while also helping to defend your body against illness. The most common methods of water filtration remove so much of the minerals that are in our water, that the water is left acidic. Virtually all bottled water available on the market today utilizes these filtration methods and therefore is also acidic. Imagine, people are trying to protect themselves from contaminants by purchasing bottled water, and instead create a condition of acidity throughout the body. This can happen as quickly as within two weeks. The buffers in our stomach simply can't keep up! The pH of your blood should be within the range 7.35-7.45. A level of 7 or less can be fatal. Increased acidity in our bodies has been associated with a number of health conditions throughout the body. Acidity is associated with infection and disease. On the contrary it is difficult for diseases to develop and thrive in a predominantly alkaline environment. It is critical that we minimise problems with our health by ensuring that the water we drink is as close as possible to our body's natural pH level. The concept of Pi water was discovered by Japanese researchers more than 40 years ago during research on plant growth cycles. The scientists isolated natural spring water with specifically-charged ion particles (ferric ferrous salt) and referred to it as "living water" from the beneficial effects they perceived it had on plants and animals. They found in later research that this substance had other highly beneficial qualities. Inducing these particles into a high energy state and infusing it through a multi stage filter process creates Pi water. Natural Spring Water has been filtered by the Earth in ways we do not completely understand which work better than any invented means of purifying water. Pi water is the closest water to human body water. It possesses high anti-oxidation properties because of it's ability to eliminate free radicals and contains a wide variety of trace minerals essential for the human body. It also provides far infrared energy, and can transfer this energy to other living systems. Top Drinking Tip: Water should be drunk pure and alone, not with or close to food. If it is combined with food or within other beverages such as juices, or teas and coffees, the body treats it as food and it must pass through the liver before reaching the colon. 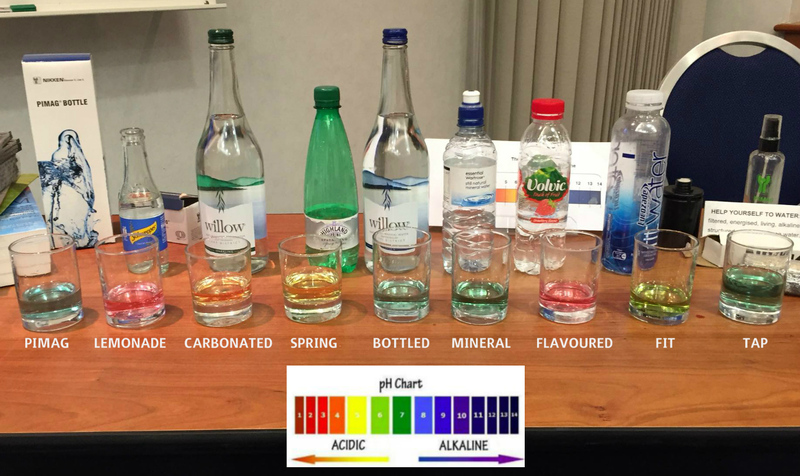 Pi water can be created using a special pi filter which also neutralizes the pH of water, making it slightly alkaline and bringing it very close to the pH of body water. Water is H2O being two hydrogen atoms attached to one oxygen atom. Because of their tetrahedral structure water molecules have an uneven charge distribution with different charges at each end. Neighbouring water molecules are held together by this uneven charge in a process known as hydrogen bonding and therefore tend to form clusters. Once clustered, water molecules are much harder to absorb at the cellular level. Applying a high powered magnetic field to water breaks these clusters of molecules into smaller groups. The water is saturated with electron-rich ions to neutralise the free radicals without the application of an unnatural electrical charge. 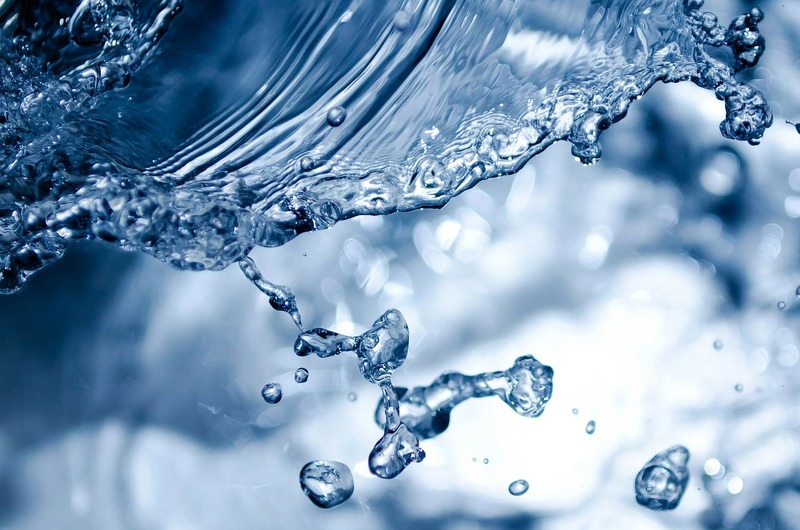 The resulting water becomes "wetter" and is much more absorbable by our bodies. Nikken has combined the best of western and eastern science in their Pimag® family of water products to give you safe and healthy mineral rich water solutions wherever and whenever you need. The Nikken Pimag Waterfall is a counter-top tap water filter that has been designed to replicate as closely as possible the natural production of spring water. Feeding your tap water through the top the water slowly falls under gravity through a filter of carbon, silica and sand, over pebbles, and out through a magnetic field before reaching your glass. The system provides superior filtration, reducing more than 30 recognised contaminants, and adds back essential minerals and electrolytes leaving you with an economical supply of Pi / Mag (living and magnetised) water without water wastage or electrical power. Since we drink a lot of our water away from home Nikken has also introduced a portable Water Bottle incorporating Pi technology. To assist in bathing there is the Pimag Ultra Shower System certified to reduce chlorine by 90% without adding chemicals to the water. Take the first step towards better hydration! Contact me with your questions or arrange a meeting to sample the water (we have representatives all over the country), or come along to one of my regular product demonstrations.